Oompa Loompa, doopety-doo, we have a perfect puzzle for you, Oompa Loompa doopety-duss, if you are wise you'll listen to us! Okay, we'll knock off that rhyming stuff, because we're not really employees of Willy Wonka's infamous chocolate factory (or house of candy horrors depending on who you talk to). Just because we don't work there doesn't mean we don't have an opinion about it. We've seen the movies. We know what happens there. Kids falling into chocolate rivers. Girls becoming blueberries. Soda that makes you float into fan blades and your assumed demise. In other words, it's a headline waiting to happen. That headline? "MOST AMAZING PLACE IN THE WORLD ALSO HAS COPIOUS AMOUNTS OF CHOCOLATE!" Kids have unique ambitions when they're young, and working at the world's biggest candy wonderland is probably one of them. These are good goals in our opinion. There are far worse things than that. But if he's going to get started down this new career path, he needs the right look. This child Oompa Loompa costume is exactly what he needs to get noticed by the purple-suited man himself, Willy Wonka. 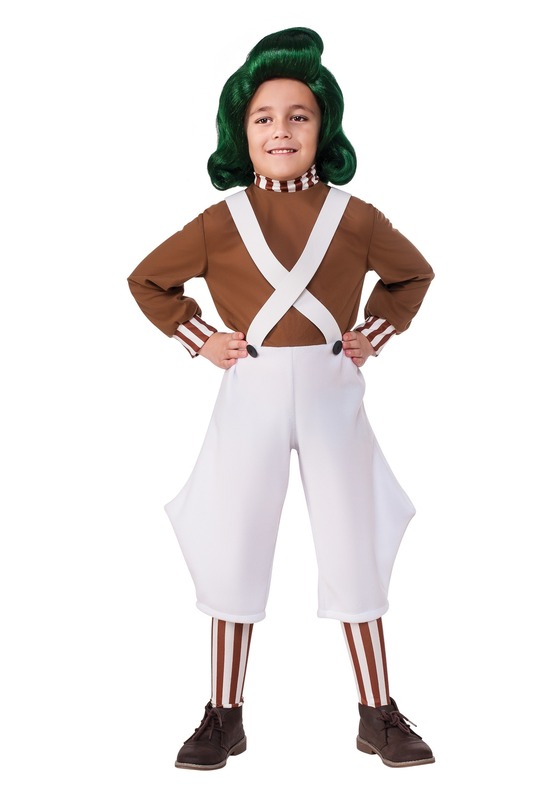 Well, actually, he'll look exactly like all the other Oompa Loompa's, but what he lacks in visual individuality he'll make up for with intense, unbridled enthusiasm for sugar. When the day comes and he slaps that application down on the front desk we just know he's going to get that job.